Hidden among rocky crevices, mollusks such as limpets, chitons and snails call the intertidal zone home. We invited guest author, filmmaker and photographer, Stephen Grace, to share his take on intertidal mollusks. Mollusks have evolved a stunningly effective feeding structure called a radula: a ribbon-like tongue covered with rows of rock-hard, razor-sharp teeth. Some predatory sea snails use their radula to pierce the shells of prey. A snail assassin first softens the shell of a barnacle or a mussel with a chemical the snail produces; then the snail uses its radula to drill through the protective covering of its victim. Once the hard shell has been pierced, the carnivorous snail extends a straw-like proboscis and slurps up the soft creature hiding inside the fortress it breached. Other sea snails, along with their molluskan cousins chitons and limpets, graze crusts of algae from hard surfaces. The sound made by a limpet scraping rock can sometimes be heard above the murmuring surf. This subtle rasping of a limpet’s radula against rock adds to the intertidal zone’s symphony of sloshing waves, shrieking gulls, and barnacles that crackle and hiss as they circulate water inside their shells. A recent study revealed that limpet teeth, made of super-thin mineral fibers packed tightly together, are the strongest biological material ever tested. A limpet’s radula has to be exceptionally tough to withstand the constant grinding caused by scraping algae from stone. The little conical-shelled mollusks create a substance stronger than spider silk, sturdier than Kevlar. Engineers are imitating the radula design of limpets to strengthen cars and boats, and even improve the fuselage of aircraft. Perhaps the spaceships we send to other worlds will someday be made of material based on principles perfected by a creature that grazes algae at the ocean’s edge. The intertidal zone is a wellspring of wonder for the human imagination. It also serves as a storehouse of designs that nature has devised and perfected through millennia of trial and error. This ageless information inspires solutions to pressing human challenges. Limpets, for example, invented a system of agriculture worthy of study. Limpets farmed the intertidal zone long before our species figured out how to cultivate crops. 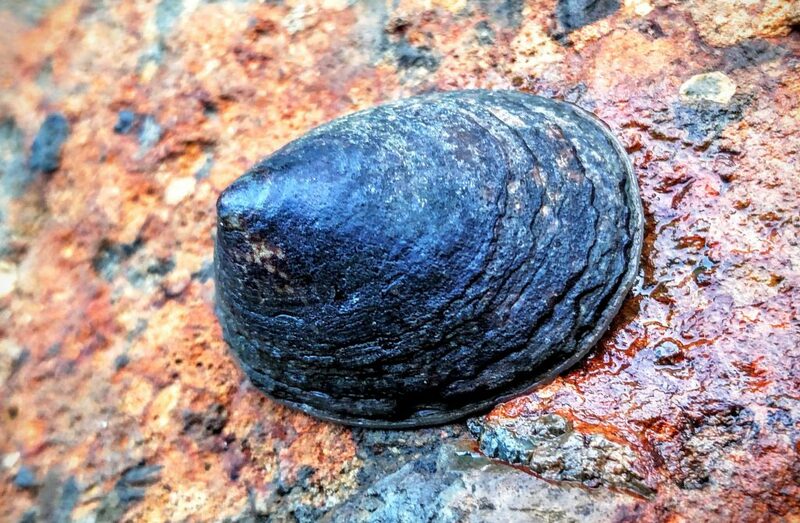 The owl limpet (Lottia gigantea) secretes mucus that stimulates the growth of the algae it eats, and this agriculturalist at the ocean’s edge aggressively defends its pasture. Using its large shell to bulldoze mussels, snails, and other limpets, an owl limpet clears competitors away from its fertilized field. When feeding, this sustainable farmer leaves at least a millimeter of turf, a technique that allows grazed algae to continue growing, ensuring a continuous food source for the limpet. Scientists are researching the potential of farmed marine microalgae to meet the food and energy needs of our species. Large-scale algae production could power machines with biofuel, feed livestock, even provide sustenance for people. Like limpets in the intertidal zone, humans may learn to cultivate algae as a solution to the problem of securing food in an increasingly crowded world. 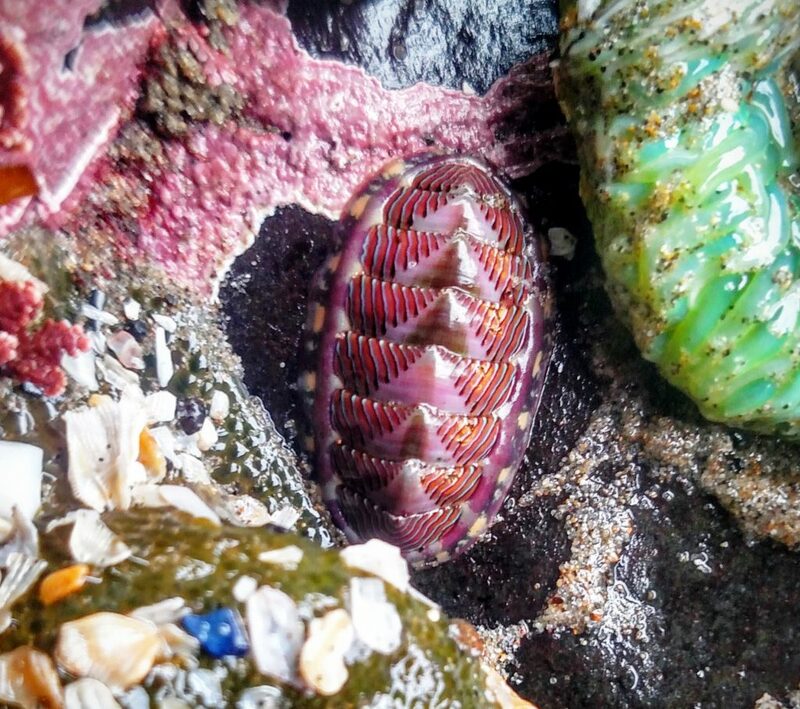 Other mind-bending mollusks of the intertidal zone are chitons, living fossils that closely resemble their 400-million-year-old ancestors. The most distinctive feature of chitons is their assemblage of eight armored plates, earning these creatures their “coat-of-mail” moniker. The articulating plates, known as valves, are held together by a strong but flexible girdle of muscle. Unlike snails and limpets with rigid shells, an eight-plated chiton can bend its protective armor to conform to irregularities in rock, giving the creature a tight grip in complicated terrain. The girdle of most chiton species covers the valve edges, but the girdle of the black katy, or leather chiton (Katharina tunicata), covers much of the animal’s surface area. A narrow strip in the girdle’s center exposes the armored structure beneath, giving the black katy its distinctive appearance. The creature’s soft black tunic is interrupted by a “window” that provides a narrow view of the eight hard valves common to all chitons. The brick-red girdle of the gumboot chiton (Cryptochiton stelleri) completely covers the creature’s valves. This is the largest chiton in the world, and arguably the weirdest. Imagine a sea creature roughly the same size and shape as a football sliced lengthwise. It also looks a lot like a slab of liver. 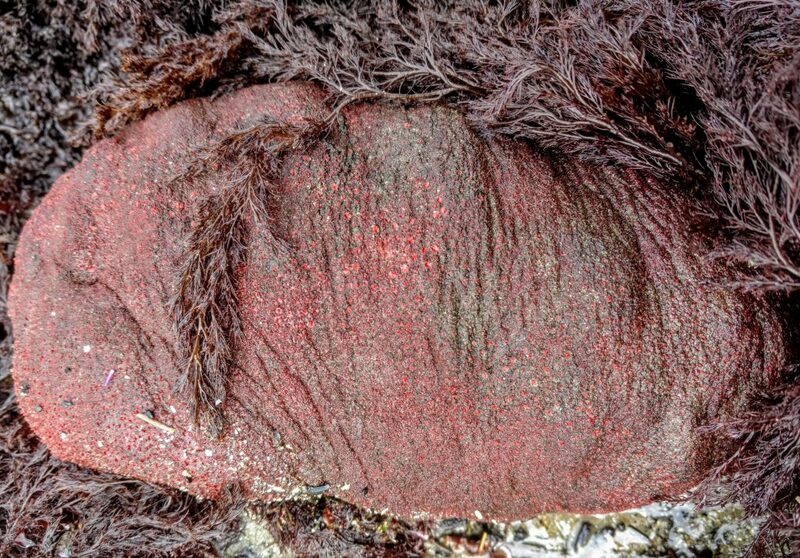 The animal’s fleshy hide, often covered in algae, is a little fuzzy—it feels subtly different from the leathery smoothness of a black katy chiton, adding texture to tactile tidepooling adventures. For visual tidepoling, it’s hard to beat a lined chiton (Tonicella lineata) crawling across a vivid crust of the pink coralline algae it grazes. The zigzag lines of purple, blue, and black that adorn this creature’s brightly colored valves seem painted by a human hand with exquisite patience and skill. The lined chiton is a beauty next to its beastly cousin, the gumboot. The gumboot is mainly nocturnal and stays hidden from the sun. 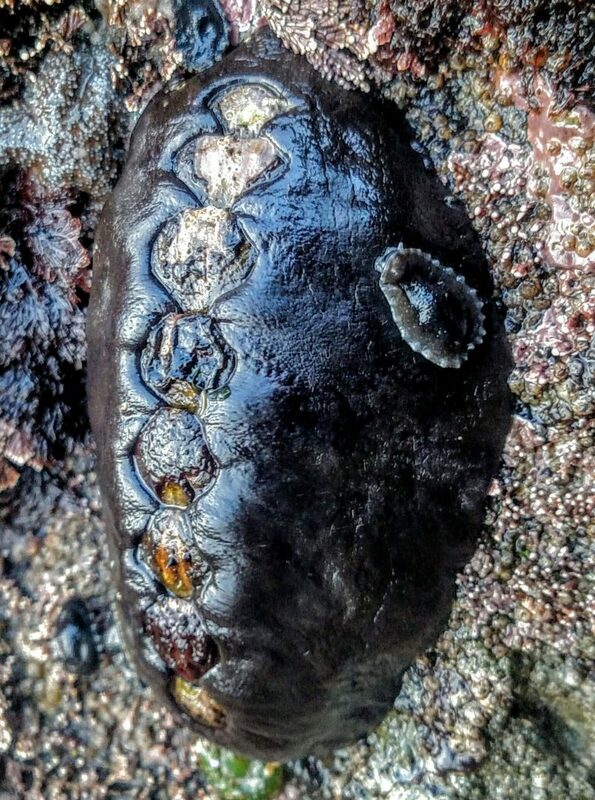 Though it is a creature of the low intertidal and subtidal worlds, on foggy days with minus tides, gumboots can turn up in tidepools among black katys, lined chitons, and a diverse array of other chiton species. These primeval beings scrape algae from rocks with radular teeth hardened by magnetite, a mineral attracted to a magnet. 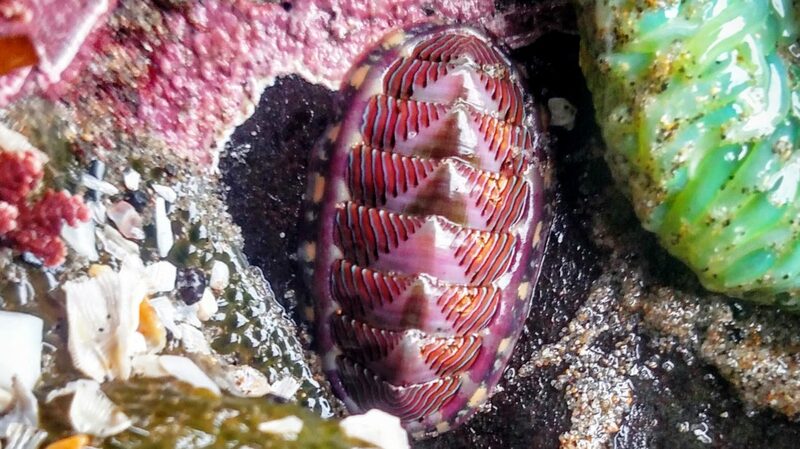 Scientists have found that chitons use magnetic fields to navigate. In the more than 400 million years that chitons have grazed algae on Earth, the planet’s magnetic field has several times flipped between the north and south poles, continents have joined together and broken apart, and cataclysms have wiped out countless species while giving rise to others. And onward the armored chitons crawl, scraping their magnetic teeth over rocks that have risen from the basement of time.